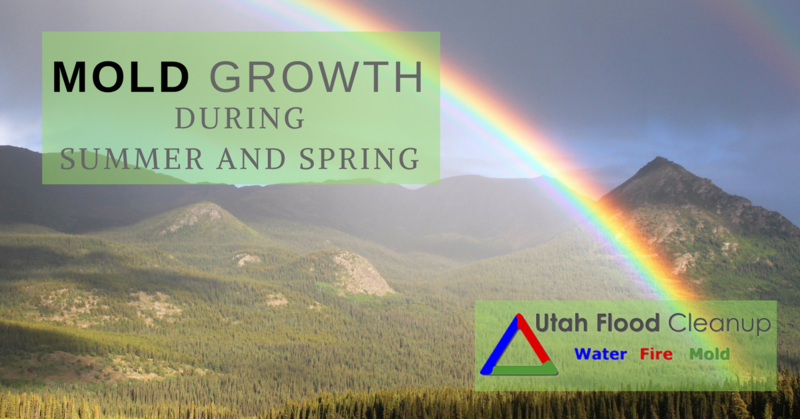 April showers bring May flowers to Utah along with a lot of extra moisture that can breed mold spores both outside and in your home. While the Spring and Summer seasons bring significant seasonal allergies to many, most of us don’t realize mold can cause allergies too and in some cases, a reaction known as mold illness. With allergy-like symptoms, mold illness can severely affect those with a weakened immune system and respiratory issues. If you or someone in your family experiences allergy-like symptoms that do not respond to allergy prevention medication, you will want to take the time to look for possible signs of mold growth during Summer and Spring in and around your home. Has there been a recent water leak? Is there a musty smell coming from the attic or basement? Mold requires a sustained moist environment and organic matter to feed on. Those who may be predisposed to developing mold illness can become sick with even mild exposure and can even affect your pets. If you locate mold growth or suspect mold but cannot see it, do not hesitate to call a professional mold removal expert with the experience and specialized equipment to identify mold, access the infestation and safely remove it from your home. Since moisture is key for mold growth, moisture control is your key to combat it. Improper ventilation along with high humidity will contribute to mold growth in the Spring and Summer months in The Beehive State. With regular housekeeping and proper maintenance of your heating and AC unit, you are helping to prevent the growth of mold and helping to sustain good indoor air quality. Homeowners with high-humidity problem areas can use a portable dehumidifier to keep mold at bay. Using your central AC unit during the humid months of Spring and the hot months of Summertime can either be helpful for reducing indoor humidity or may actually be contributing to the problem. An oversized AC unit may cool your home faster, but it will not remove as much moisture as a unit that is proportionate to the size of your house. Optimal air distribution and adequate ventilation are vital for maintaining good air quality and preventing mold growth. (h4) If moisture is an ongoing problem in your home, you may consider adding a dehumidifier to your central AC to stabilize indoor air quality. Indoor Humidity Control -The humidity in your home should be between 30 and 50%. If humidity is a concern, the use of a humidity gauge and a humidifier will help you monitor and maintain indoor humidity levels. Air Circulation – Our homes can become humid from everyday activities like showering, cooking, and cleaning. You can increase air circulation and decrease humidity by running bathroom vents, opening windows and doors on warm, low-humid days. Window Condensation – Storm windows or quality windows with insulated glass can help to prevent window condensation problems. Condensation in Ducts – HVAC ducts with excess moisture should be repaired or replaced if there is a condensation problem. The surrounding insulation will also need to be replaced if it is wet. Blocked Gutters – Bi-annually cleaning out your gutters and downspouts will help prevent water accumulation. Sitting Water Under the House – After the rainy season, it is a good idea to check the crawl space for excess moisture. Some homeowners apply black plastic to the ground under the house to help reduce humidity during the humid Spring months. Keep garbage cans clean and out of the elements to prevent moisture from accumulating. Cleaning out gutters and drains will help prevent indoor humidity through leaks and removes the damp debris that mold grows in. Limit your exposure to obvious sources of mold like compost bins, piles of decomposing debris and damp soil. Keep the grass and shrubs trimmed, especially around your home’s foundation. Increase sun exposure by keeping trees pruned. Prune and cut trees to increase sun exposure. Try to limit your exposure by avoiding outdoor activities on rainy or windy days when harmful mold spores will likely get stirred-up. Since 1992, Utah Flood Cleanup has been providing residential and commercial property owners with disaster clean-up including mold removal and repair from mold damage. Our team of highly-trained specialists will help locate, identify and eradicate mold and mold spores from your home. Contact Us or call our mold removal professionals at 801-416-2666 for your free mold removal phone consultation and free estimate. We back our work with a 5-Year Guarantee and provide flexible financing options. We are available 24/7 to help with your disaster emergency and get your life back to normal.